Your wedding day is one of the most important events in your life and at Shap Wells Hotel you will be receiving service of the highest professional quality and will benefit from our long and vast experience of catering for specialised events such as weddings. Naturally, you want it to be a very special day for you, your partner, family and friends, let us at Shap Wells Hotel enable and assist you with the planning and preparation. We are here to help and support you every step of the way and we will ensure that everything runs as smoothly as you would like it to be, thus, leaving you and your partner free to celebrate the most wonderful time of your lives. You will see that we offer a variety of venues for both civil ceremonies and celebration parties, with the flexibility, unique in Cumbria, to cater for receptions from 10 to 350 guests and for civil ceremonies for up to 150 guests. Our Civil Wedding Ceremony licence means you can make your marriage vows and enjoy the convenience of having your reception under the same roof. The rooms are also ideal for other celebrations such as birthdays, engagements and anniversaries. With the need for careful budgeting in mind, we offer an extensive wedding breakfast package and also a civil ceremony and evening reception package. 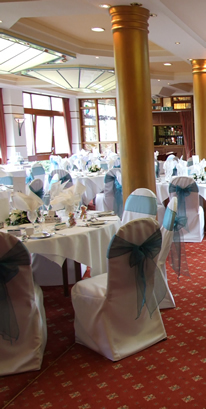 The Birkbeck Ballroom & Riverside Lounge is a beautifully decorated air-conditioned suite large enough to seat 300 for a formal celebration but can be reduced in size to accommodate parties as few as 90 guests. For evening buffet and dance, it will accommodate 350 guests. The Lodge Howe Room, with its self-contained bar, is ideally suited for formal celebration of up to 90 guests. 110 guests can be accommodated for an evening buffet and dance. These smaller rooms are suited to more intimate parties, of up to 30 and 20 guests respectively. They are not suitable for an evening buffet and dance. Located on the ground floor but accessed via the lower ground floor the Lodge Howe Room will accommodate up to 150 guests for a civil ceremony. Located on the lower ground floor the Garden Room will accommodate up to 60 guests for a civil ceremony. Located on the lower ground floor the Cautley Room will accommodate up to 35 guests for a civil ceremony. Located on the lower ground floor the Winder Room will accommodate up to 20 guests for a civil ceremony. Located on the ground floor the Boardroom will accommodate up to 15 guests for a civil ceremony. Located in a romantic woodland setting beside the Blea Beck, only suitable on dry days, the Superintendent Registrar will make the decision if the Ceremony can take place at the Spa. Our experienced Meetings and Events Co-ordinator is available to discuss your requirements with you and to show you around the hotel and grounds. Please call 01931 716628 or email Sales@ShapWellsHotel.com to make your appointment.